Mattel is rolling out the old sixties Liddle Kiddles dolls in the form of the new Barbie Peekaboo Petites. I have long been a Kiddles fan. Although they slightly predate me, I started collecting them at antique malls and garage sales in college. The new Peekaboo Petites look really charming and they're priced right for holiday giving, about $10-$15. I love the cute packaging and tininess of them. I want all of them. I mean, Roo wants all of them. Uh, right. 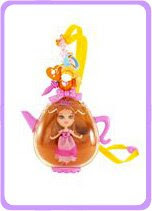 This lovely lady is a Cute-Tea and she'd like to remind you to check back here tomorrow for the week-long Tea Party! Ah! Isn't she adorable? I just love her! I mean, may we see your collection? I loved little kiddles when I was young, and still have a couple of them. Oh no way, I didn't realize that. Little Kiddles were before my time, but they are so adorable. I was going to buy the house with the Barbie deal going on, now I want it more for my dd, lol.